Ah, a bowl of potato chips. 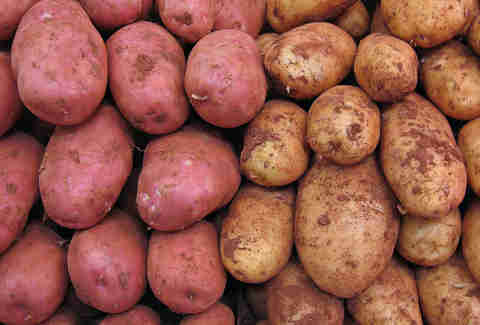 The forbidden fruit of the vegetable world. A staple food of Homer Simpson. Refuge of the socially awkward at parties. Salty, oily, and compulsively eatable -- is there anything not dangerously awful about this beloved snack? Actually, yes! 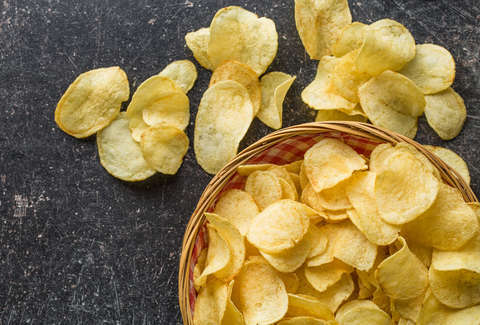 In a wasteland of processed junk foods, potato chips stand out as a heroic option, usually featuring only three ingredients: potatoes, vegetable oil, and salt. Read on for why that’s worth keeping in mind when the munchies strike. Note: for the purposes of this discussion we're talking plain, salted potato chips. That's not to say you shouldn't explore the vast array of flavor concoctions out there at your own risk, but if you're trying to keep it healthy-ish, simple is your best bet. Yes, it really does (and so does salt, for that matter, despite what you may have read). Vegetable oil contains linolic acid, an omega-6 fatty acid, which is an important part of healthy diet according to a recent study by the University of Missouri and University of Illinois. While some fats can cause inflammation in the body, which is linked to heart disease, those are by and large animal fats, not vegetable oil. You can even find potato chips made with olive oil these days, which is fairly universally recognized as one of the healthiest members of the vegetable oil family. 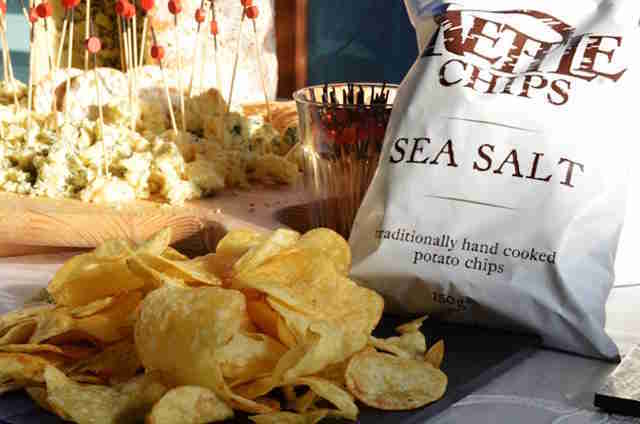 Another selling point: potato chips are vegan AND gluten-free, so no one will shun them at your Super Bowl party. You know what else is great about potato chips? What they don’t have. Sitting here reading the ingredients on a bag of Kettle chips, I see potatoes, peanut oil, and sea salt. 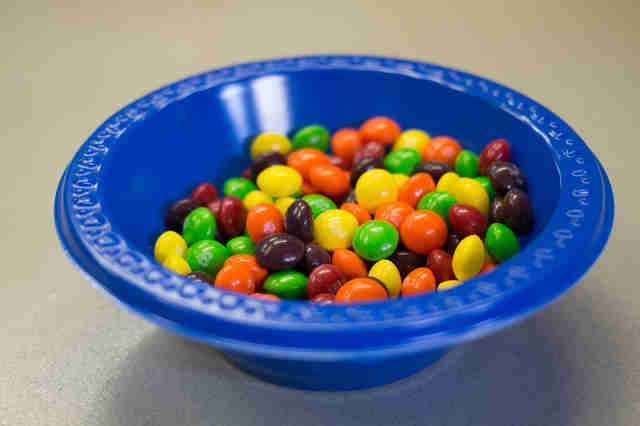 I don’t see preservatives, artificial flavoring, artificial colors, or sugar. You better believe all those things are present in Cheetos -- and guess what, the artificial Yellow 6 color that gives Cheetos their signature orange hue is actually made from petroleum and causes kidney and adrenal gland tumors in animals. The virtuous potato chip would never do you like that. How do they stack up against candy? What about that acrylamide thing? A few years back, researchers noticed French fries and potato chips contained a substance called acrylamide, a carcinogen. But it turns out that’s probably not a big deal, as no link between dietary acrylamide and cancer has been established, and acrylamide is present in many other foods. Now let's be clear -- we are not advocating for the practice of polishing of an entire Costco-sized bag of chips while you lounge on the couch all day. Potato chips should not be among your dietary staples -- we're simply saying that, as satisfying genuine indulgences go, you could do a lot worse than a reasonably sized portion of potato chips. Enjoy them in moderation (yes, it's possible! ), as part of a diet rich in fresh fruits and vegetables, whole grains, and lean proteins... because you already knew anything fried shouldn’t count as a dietary staple, right? Right? Missy Wilkinson feels vindicated because her junk food of choice is Zapp’s potato chips. Follow her on Twitter at @missy_wilkinson and Instagram at @nowlistenmissy.